Mary Stella Cooper Young, daughter of Oscar Jackson Cooper and Elizabeth Abigail 'Bettie' Taliaferro, married to Burford Agee Young and buried in Elmwood Memorial Park Cemetery, Abilene, Taylor County, Texas. 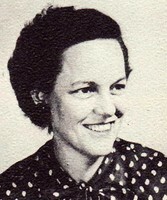 Lawn Independent School District High School Teacher (1954-1957). First Jim Ned Consolidated Independent School District Seventh Grade Teacher (1957-1959).